It’s official: 2018 was the fourth hottest year on record, scientists at NASA and NOAA confirmed in a report released today (Feb. 6). The report is the latest installment of a yearly analysis that compares the two agencies’ independent global temperature measurements with historical data. Both of those agencies’ datasets are produced purely from observations gathered at ground stations around the world. But satellites play an important role in validating that data, offering additional information about climate and helping the agencies track climate processes. Both of the new analyses are based exclusively on data gathered from ground stations because that gives scientists a longer continuous series of matching measurements — back to 1880, long before humans had satellites studying climate as well. Comparing ground-based and satellite data faces the proverbial apples-to-oranges challenge. 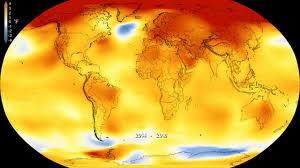 But those satellites are still crucially important to studying climate.